It was a mixed day at Turnberry which saw Tom Watson needing a par 4 on the 18th hole to pick up his sixth Open Championship, and second at Turnberry. Watson bogeyed the 18th and went into a two way play off with Stewart Cink who had just birdied the 18th. 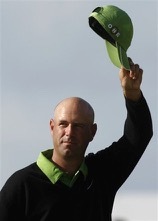 It was a 4 hole playoff over 5, 6, 17 and 18 which saw Cink win by six shots when Watson faded pretty much straight away. It is a real shame for Tom Watson who was leading on every day of the championships.